This is part of a special report by YES! Magazine: The Spirit of Standing Rock on the Move. Sometime last year, the Standing Rock Sioux Reservation in North Dakota became not just a physical location but an iconic challenge to the national conscience. Like the Selma Civil Rights Marches in 1965 or the Frank’s Landing Tribal Fishing-Rights Demonstrations in 1970, Standing Rock’s water protectors, as they all themselves, have transformed ideas of advocacy and resistance with nonviolent direct action and prayer. They have built coalitions across movements for tribal sovereignty, defense of natural resources, resistance to expanding energy infrastructure, and cultural survival. They have shown the world a culture grounded in stewardship and connection to earth. The resistance that persisted even through the cold and dark of the North Dakota winter, with ongoing injuries and arrests, shows how difficult, dangerous, and uncertain it can be to speak truth to power. Now the spirit of Standing Rock is on the move. Its Native-led, youth-driven expertise is extending outward to help other communities protect their land and resources. In Texas, Frankie Orona, from the Borrado, Chumash, and Tongva people, is leading actions against the Trans-Pecos Pipeline, which will carry fracked gas across Texas and into Mexico, if completed. For months, he and others have danced, prayed, and sang in the path of the line. Recently, they were arrested after locking themselves to construction equipment. In December 2016, after consulting with the Indigenous Environmental Network, which was central to organizing the Standing Rock resistance, Orona’s group established a camp and built a Native/non-Native support system, similar to Standing Rock’s, with backing from local environmentalists and ranchers. One rancher is hosting the camp on her property. Standing Rock has also been evoked in Florida and New Jersey, where Natives and non-Natives have united to object to the Sabal and Pilgrim pipelines, respectively. In Florida, four camps were recently established to protest the Sabal line, and on January 6, Dallas Goldtooth of the Indigenous Environmental Network went live on Facebook to urge Standing Rock water protectors to go support these other fights. Elsewhere, Native people are standing up for mountains. In Hawai’i, conflict rages over placing another telescope on the holy peak Mauna Kea. Prayer gatherings, blockades, arrests, declarations of Native self-determination, and a lawsuit have blocked the project so far. In Arizona, longtime protests have also sought to roll back desecration of Mount Graham, where a telescope mars the sacred summit, and the San Francisco Peaks, contaminated by wastewater that a ski area uses for snow-making. Certainly the Standing Rock campaign has inspired wider interest in Native struggles, agrees Judith LeBlanc, director of the Native Organizers Alliance and member of the Caddo Nation of Oklahoma. “People everywhere are talking about Standing Rock, which has magnified the reality of other situations like it,” says LeBlanc. She calls the awareness a “Flint moment” for Indian Country. And she is optimistic. She notes that tribal struggles are ever more successful: “Stopping drilling in the Arctic and a giant coal export terminal in the Northwest, canceling oil and gas leases in a Blackfeet cultural landscape — these successes have been Native-led,” LeBlanc says. As Shoshone-Bannock professor and pundit Mark Trahant has pointed out in YES!, the end of these stories is no longer “inevitable,” with Native communities always losing to outside interests. Chief Arvol Looking Horse, 19th Generation Keeper of the Sacred White Buffalo Calf Pipe, spiritual leader of the of the Lakota, Dakota and Nakota Nations. (Photo: Joseph Zummo)Tribal advocacy has helped protect more places in recent weeks. In Colorado, the Piñon Pipeline will not go forward, the company that was planning to build it has announced. In the last weeks of President Obama’s term, he protected the ancient spiritual places and magnificent scenery in southern Nevada as the nearly-300,000-acre Gold Butte National Monument. He did the same for 1.35 million acres in southern Utah, now the Bear Ears National Monument. Notably, at Bear Ears indigenous people will contribute to ongoing management decisions. Though state and congressional officials have said they will fight both monument designations, such actions are difficult to unwind. Before there were states, there was Indian Country. In 2016 there were 326 federally recognized American Indian reservations. About 22% of the 5.2 million Native Americans live on tribal lands. Click on the points on the map below to explore seven stories of Native resistance. “An accident waiting to happen” is how Chairman Aaron Payment of the Sault Ste. Marie Tribe of Chippewa Indians, in Michigan, described aging, mussel-encrusted pipelines carrying 540,000 barrels of oil and natural gas daily through the Straits of Mackinac in the Great Lakes. “It’s very frightening,” agrees Stella Kay, vice chairwoman of the nearby Little Traverse Bay Band of Odawa Indians, in Harbor Springs, Michigan. The protests at Standing Rock have called attention to the proliferation of new pipelines, but old ones found all over the country are also very dangerous, according to Kay. The resource threatened in her area is massive. The five Great Lakes together contain 20 percent of the planet’s fresh surface water, providing millions of people with drinking water, supporting a vibrant tourism industry, and offering bountiful fisheries. Lying on the lake bottom are twin pipelines dating to the 1950s. Called Enbridge Line 5, they are part of the system that burst in 2010, dumping 840,000 gallons of oil into Talmadge Creek, leading into the Kalamazoo River, in Marshall, Michigan — the nation’s largest inland oil spill so far. “Half of the pipelines in America predate our current environmental laws and protections,” said Payment. He was speaking to federal officials during meetings to discuss improving the government’s consultation with tribes on infrastructure projects. A leak in the straits would be devastating in good weather, but if it happened in winter and the damage were frozen under the ice for weeks or months, the effect on the sensitive environment and the regional economy would be unimaginable, says Kay. Adding to area tribes’ concerns, figures from the Pipeline and Hazardous Materials Safety Administration (PHMSA) show that detection systems and the employees running them do not discern most of what the agency calls “significant incidents.” Of the more than 4,000 significant incidents reported to PHMSA over six years, detection equipment recognized less than 10 percent, while the general public and techniques like ground and aerial patrols spotted the rest. Some may think of treaties as dusty documents that are no longer relevant. Not so, says Indian law attorney Rollie Wilson, with Fredericks Peebles & Morgan. They are contracts between governments and are enshrined as “the supreme law of the land” in Article 6 of the US Constitution. Memories of the Kalamazoo River accident are still fresh in the area. When the Michigan Petroleum Pipeline Task Force asked for public input for its 2015 report on Enbridge Line 5, the consensus was clear. Most respondents said to shut it down. Enbridge procedures have changed for the better since 2010, says company spokesperson Ryan Duffy: “That event was transformational for us.” According to Duffy, Enbridge Line 5 is now monitored 24/7 from an “enhanced” control center that would automatically shut it down, should a break occur. That would presumably prevent what happened during the Kalamazoo River accident, when an Enbridge employee misread the signals and pumped even more oil through the broken Line 5, worsening the spill. Duffy describes today’s inspection techniques as high-tech and continual with divers, robotic vehicles, and MRI-like scanning devices searching for corrosion and cracks. The company has resisted replacing the line. Duffy explains that it was “over-engineered” for its day with especially thick, enamel-coated steel. The task force report casts doubt on this rosy assessment, noting that Enbridge makes public only its inspection conclusions, not its data. As a result, there is no way to verify the company’s assertions. Years of mussel-encrustation may have caused corrosion and added damaging weight to the pipes, which lacked sufficient anchors to the lake bottom “for an apparently extended period,” the report says. Enbridge will be “taking some time” to review the Band’s decision before determining its next steps, says Duffy. “Water is the giver of life in all tribes’ prayers,” explains Wendsler Nosie Sr., leader of the Apache Stronghold movement. “It is the blood of the world and unifies us all. These teachings go back to the beginning and have been passed from generation to generation, from family to family. They resonate from truth and are unchangeable.” The Apache Stronghold movement he leads is an effort to save Oak Flat, an Apache sacred landscape in Arizona. Before Standing Rock, there was Oak Flat. Like Standing Rock, the encampment at Oak Flat is remote. Yet members from outside tribes, representatives from national and regional tribal coalitions, and non-Native supporters, including members of environmental and religious groups, have shown up in droves. The media has been attracted by dramatic supporting events, including participation in a Neil Young concert, a flash mob in Times Square, and a demonstration in Washington, D.C. “Movie stars, resisters tying themselves to heavy equipment, it all happened here,” says Nosie. The press coverage, in turn, has kept alive public interest in protecting the sacred place. The Oak Flat controversy exploded in December 2014, when the Arizona congressional delegation slipped a land swap into the National Defense Authorization Act for Fiscal Year 2015. The measure privatized a 2,400-acre traditional cultural landscape in the Tonto National Forest that has been revered by Apaches and other tribes since time immemorial. It then gave the tract to Resolution Copper Mining in return for approximately 5,000 acres of company land. The British- and Australian-owned corporation plans to develop a giant copper mine that would, over its 60-year life span, turn the sacred site into a two-mile-wide hole in the ground, deplete and poison the area’s water supply, and produce a massive dump site of toxic mine waste, according to tribal and environmental opponents. “The profits will go overseas, and the United States will be left with the ugly results,” says Nosie. In another step forward, Oak Flat made it onto the National Register of Historic Places in March last year. This does not afford permanent protection but adds requirements to an already-detailed environmental review that is in the initial stages. From time immemorial Western Shoshones have hunted, gathered, and participated in ceremonies in a rugged landscape in what is now northern Nevada. “We arose here,” says medicine man Reggie Sope, of the Duckwater Shoshone Tribe, as he describes a careful, frugal lifeway that found bounty in these dry, rolling hills. His people hunted deer, rabbits, and other game and gathered wild onions and carrots and additional edibles. When the rabbit brush turned yellow in the fall, they trekked to forested mountains to pick pine nuts, a dietary staple they would roast and store for later use. Called Tosawihi (dose-uh-wee), the place’s name is derived from that of a Western Shoshone band known for carrying razor-sharp blades made from the exceptionally hard flint found here. The stone has properties that assist traditional healers to this day. This life and its seasonal round continued for millennia — until newcomers arrived looking for another kind of bounty. In the mid-19th century, silver and other valuable minerals were discovered in what, in 1864, would become the state of Nevada. The 1872 General Mining Law made it cheap and easy to stake out claims, driving up the population of settlers. To this day, a few hundred dollars will establish and hold a claim on public land that can be mined, with no royalties due to the federal government, unlike other extractive industries. Sope’s people were pushed onto reservations despite an 1863 friendship treaty with the United States in which the tribes never ceded any land, including most of what is now the state of Nevada. It remains a bone of contention with the federal government. The valley where the Western Shoshones are camped seems idyllic and untouched, but a foray out of it reveals much damage to the surrounding landscape. A horizontal cut scars the face of a hill used for eons for vision quests. The gouge was bulldozed during construction of a power line to support increased production at the gold mine that has taken a giant bite out of nearby hillsides. The power line also wiped out a centuries-old trail, where an ancestral healer walked, sang, and picked medicinal plants. People who needed care would hear his song and follow him. Tosawihi sits on federal land administered by the Bureau of Land Management (BLM). As such, national preservation and environmental laws protect Tosawihi. Western Shoshones have invoked these laws, telling courts that Tosawihi is a cultural landscape that is the product of many centuries of subtle interlocking practices — hunting, gathering, healing, and other aspects of traditional life. Portions of it have been determined eligible for the National Register of Historic Places. Tribal members claim that damage to Tosawihi could be avoided or minimized if the BLM followed federal law. Court documents submitted by the BLM say the tribe is asking too much and call the tribal perspective the product of a “different worldview.” The agency has commissioned archaeological studies that have identified scattered locations on the landscape that can be considered for preservation under the law, while the rest may be subjected to mining-related destruction. Joseph Holley, former chairman and now councilman of the Battle Mountain Band of the Te-Moak Tribe of Western Shoshone, learned about protecting tribal resources from watching his elders, and now his young grandsons stick close by, watching and learning. For Alaska Natives, tours of Nevada’s gigantic mines helped them learn how to protect their own critical resource, Bristol Bay. The Alaska tribal people needed to understand what they were facing when a mining consortium proposed placing what would be among the largest copper mines in North America, Pebble Mine, in the bay’s watershed. It is home to the world’s largest sockeye salmon fishery and one of its most prolific king salmon fisheries, providing thousands of jobs and pumping $1.5 billion into the US economy in a year, according to a 2010 University of Alaska study. The fishery also supports Alaska Native subsistence lifeways and cultures. Kimberly Williams is the Yup’ik director of Nunamta Aulukestai (or “Caretakers of Our Lands” in Yup’ik), a tribal coalition in southeast Alaska that focuses on land-use issues. Williams says that when opposition to Pebble Mine gathered steam in 2004, tribal members realized they needed to learn how to effectively combat the project. The environmental nonprofit Earthworks helped Williams and other tribal members reach out to Western Shoshones to learn about modern large-scale mining. Groups ranging in size from about eight to 15 and representing tribal communities around the bay traveled to Nevada starting in 2008; in 2012, a group visited Wendsler Nosie Sr. in Oak Flat, says Bonnie Gestring, an Earthworks staffer who accompanied the Alaskans. The Alaska Natives also talked to the area’s indigenous communities, including the Elko Band of the Te-Moak Western Shoshone. “They could ask whether promises — about jobs or effects on the environment and subsistence lifeways, for example — had been kept,” says Gestring. The answer was generally no, she reports. The environmental impacts are crushing, the visitors to Nevada learned; moreover, modern-day mining is highly technical, with few jobs for local people seeking to break into the industry. Teresa Williams fishing for smelt at Lake Aleknagik. (Photo: Kimberly Williams)In the end, groups and individuals statewide — Native and non-Native — supported a ballot measure empowering the legislature to ban mines it determined harmful to wild salmon. This was despite opposition from industry groups like the Alaska Miners Association, which claimed the measure would politicize the mine-permitting process and stifle Alaska’s economy. Northern Dynasty Minerals, the primary corporation behind the mine, has sued the EPA, claiming environmental groups improperly influenced the agency’s report. The lawsuit is ongoing. Leading up to Memorial Day 2011, giant dams along the Missouri River were filled to the brim with water produced by torrential rains and higher-than-normal snowmelt. Among the farms, towns, and other entities downriver was the small, impoverished Omaha Tribe, where unemployment has hovered at about the 80 percent mark and a casino has been a major source of both revenue for the tribe and jobs for the few tribal members who have them. Since the mid-20th century, the US Army Corps of Engineers has used dams large and small to reengineer the mighty Missouri and its tributaries. At first, the idea was to prevent flooding and facilitate navigation while providing electricity. Recent modifications include artificial sandbars to slow the river and make it more hospitable to recreation and wildlife. In 2011, it was clear that the now-man-made waterway had become a fearsome Franken-river that its creator and master, the Corps, could no longer control. On May 27, the Corps told the Omaha Tribe it would release the Missouri’s swollen waters, and the tribe should expect the river’s level to rise quickly by as many as nine feet. The damage up and down the river was disastrous. “The [Missouri’s] water no longer moves on through,” says Debbie Yarnell, spokesperson for law firm Polsinelli, which has sued the United States for the Corps’ decision. The suit was filed on behalf of nearly 400 plaintiffs, including the Omaha Tribe and farmers and businesses in five states the Missouri River traverses. “Thanks to the work done to slow the river, the water sits longer and does more damage,” says Yarnell. However, agencies are not necessarily cooperative. In May 2011, on the Omaha reservation, the Corps’ consultation with the tribe was more along the lines of “ready or not, here it comes,” just days before the water hit. Former tribal chairman Vernon Miller reported this tragic lapse to federal officials attending one of the meetings the Obama administration called this past fall to discuss improving the government’s consultation with tribes. Questions about whether the Standing Rock Sioux were properly consulted during decision-making for the Dakota Access Pipeline precipitated the gatherings. Historical photo from the Omaha tribe of Nebraska. The Corps also failed to meaningfully assist the Omaha Tribe once it was clear they were facing a catastrophe. “I asked the Corps to come and help us evaluate what we could do,” recalls Omaha Tribe Emergency Management Director Carroll Webster. “They said they could send one guy for a few hours.” According to Corps spokesperson Eugene Pawlik, the agency is unable to respond to questions or provide comments because of the ongoing litigation. Over the next several weeks, the community mobilized, with tribal employees and volunteers digging up land from elsewhere on the reservation and creating a berm to try to stem the flood. Despite their efforts, their homeland was inundated, including the casino and, with it, a financial mainstay. Destruction of farmland leased out for additional income meant more economic devastation. Miller implored the federal officials at the consultation meetings to learn from these mistakes. Their decisions have huge impacts on tribal communities, he said, and consultations must be person-to-person, as well as government-to-government. A phone call or a letter warning of impending disaster is not enough, said Miller: Respect for tribal sovereignty demands more from the federal consultation process. The San Juan River is one of the nation’s latest Superfund sites. This past fall, it joined the 1,337 locations now on the US Environmental Protection Agency’s list of contaminated places. Nearly one-quarter of them are on Indian reservations, according to Indian Country Today Media Network, meaning that about 1 percent of the US population sustains 25 percent of the environmental and related cultural damage. The San Juan River, which pours down into the Navajo reservation from the Rocky Mountains, turned a ghastly orange on August 5, 2015. This occurred as a result of EPA activities at the Gold King Mine in Colorado. The mine is one of many abandoned operations sitting by creeks whose waters eventually end up in the San Juan. While attempting to draw off contaminated water, EPA-hired construction crews with heavy equipment triggered the collapse of a portion of the mine and a three-million-gallon blowout of toxic sludge laced with lead, mercury, and other heavy metals. Even worse, the agency didn’t tell the Navajo Nation that the poisons were headed for tribal members’ homes and farms until two days later. The EPA has taken responsibility for the disaster and has so far spent $29 million to clean it up. 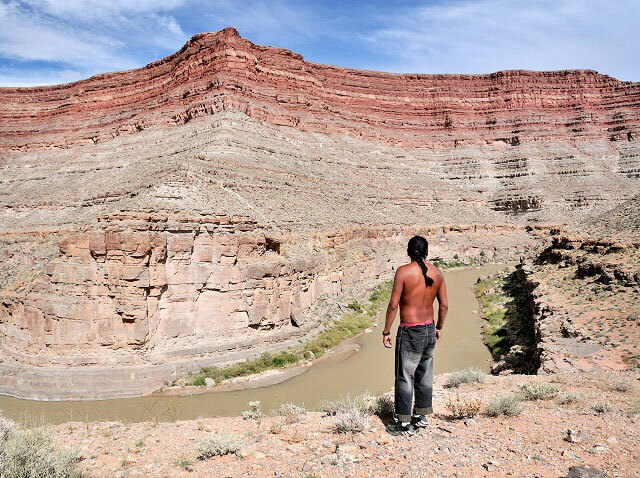 Tribal member Mark Maryboy lives in Montezuma Creek, Utah, a tiny Navajo-reservation village on the San Juan River. “We still can’t drink the water or farm more than a year later. The spill brought Navajo farming and the area economy to a halt,” says Maryboy, a board member of Utah Diné Bikéyah, the grassroots group that in 2010 initiated the process of designating the Bear Ears National Monument. The waters of the Animas River, a tributary of the San Juan River, ran orange within 24 hours of the spill in southwestern Colorado. (Photo: Riverhugger)In August 2016, an infuriated Navajo Nation sued the EPA, claiming that the damage to the river had caused anguish “akin to the loss of a loved one.” Tribal members worry about health consequences, and ceremonies that use sand and water from the river and pollen from once productive cornfields have been interrupted, says the Navajo brief. Tourists have stayed away, causing more economic pain. In a statement supporting the tribe’s lawsuit, US Representative Ann Kirkpatrick (D-Ariz.) declared that for Navajos “water is life.” She reminded the EPA that the federal government holds Native lands in trust for tribes and their members and, as the trustee, has obligations to protect Native land and natural resources. The Justice Department, which will defend the EPA, has not yet responded to the complaint, according to attorney Moez Kaba, who is part of the team representing the Navajo Nation. The EPA has announced that the river is greatly improved and “trending” toward its pre-spill condition. “Navajo people don’t believe them,” says Maryboy. “We have been exposed to dangerous materials before, including uranium from Cold-War era mining in this area, and have cancer and other diseases that result from such exposures.” Navajos worked in the mines for four decades without safety gear; then, once the mines were closed, it took nearly three decades more for the EPA to begin removing the toxins. The agency started with a small program in 2008 and recently began a one-billion-dollar cleanup, funded by a settlement with the mine operator. The Columbia River Gorge sits between Cascade Locks, Oregon, and Goldendale, Washington, where Nestlé has been trying to identify a spring from which it could draw off and bottle water. (Image: Still from a Story of Stuff Productions video)“When the tribes stepped forward to talk about their treaty rights, as well as the human rights issues involved with losing water, it was incredibly powerful,” says Julia DeGraw, Northwest senior organizer for Food & Water Watch. Since 2009, DeGraw and a grassroots group of local landowners, businesspeople, and others have been seeking to stop Nestlé Waters North America from “spring shopping” in rural Oregon. The corporation has been trying to identify a spring where it could draw off and bottle water that would be sold at a premium because of its pristine origins. The first place Nestlé tried to set up shop was bucolic Oxbow Spring, in the town of Cascade Locks, Oregon. The company claimed it had done hydrological, air quality, and other studies and found the project would be sustainable and have little environmental impact. In return, the town could get around 50 jobs, Nestlé Waters said. After a severe drought heightened local fears about selling off water, residents of the surrounding county, including the tribal members, mobilized. They held rallies and wrote a ballot measure that would make it illegal to bottle water in the county. They knocked on doors and attended events to gather support for the measure. The Confederated Tribes of Warm Springs chimed in, decrying the bottling project, saying it had moved forward without proper tribal consultation and public review. Warm Springs tribal member Annie Leonard fasted. In May 2016, 69 percent of the county voted to approve the measure and nix the Nestlé project. The ballot measure wasn’t binding on the town, though, which appeared to be still interested in moving forward. In a sternly worded letter, the Yakama Nation warned Cascade Locks that drawing off the water would “undermine our culture and threaten our treaty-reserved rights.” The tribe explained its duty to protect “those resources that cannot speak for themselves, including our water.” The letter went on to explain the reciprocity between the tribe, as a caretaker, and the water, which nurtures the natural resources the tribe needs for its existence — timber, fish, animals, and more. The tribes are standing fast. During a November 2016 Goldendale city council meeting, the Goldendale Sentinel reported, Yakama general counsel Ethan Jones called threats to tribal water rights “genocide” and vowed “we will do whatever it takes” to stop them. Stephanie Woodard has covered Indian Country for more than 15 years for Native-owned Indian Country Today Media Network, as well as for In These Times and other national publications. The Fund for Investigative Journalism and the former George Polk Center for Investigative Reporting have supported her work. The Native American Journalists Association, of which she is an associate member, has recognized her with its top annual prize, the Richard LaCourse Award.